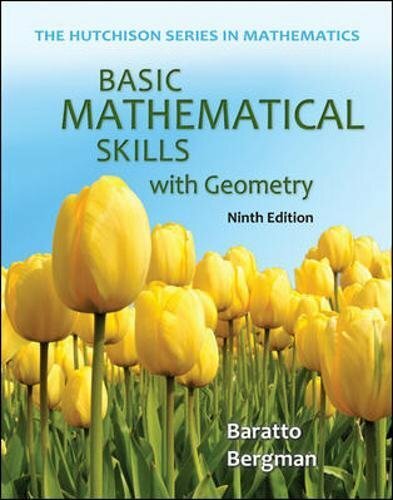 Basic Mathematical Skills with Geometry, 9/e, by Baratto, Bergman, and Hutchison is part of the latest offerings in the successful Hutchison Series in Mathematics. The book is designed for a one-semester course in basic math and is appropriate for lecture, learning center, laboratory, and self-paced settings. The ninth edition continues the series’ hallmark approach of encouraging mastery of mathematics through careful practice. The text provides detailed, straightforward explanations and accessible pedagogy to help students grow their math skills from the ground up. The authors use a three-pronged approach of communication, pattern recognition, and problem solving to present concepts understandably, stimulate critical-thinking skills, and stress reading and communication skills in order to help students become effective problem-solvers. Features such as Tips for Student Success, Check Yourself exercises, and Activities underscore this approach and the underlying philosophy of mastering math through practice. Exercise sets have been significantly expanded and are now better-organized, and applications are now more thoroughly integrated throughout the text. The text is fully-integrated with McGraw-Hill’s online learning system, Connect Math Hosted by ALEKS Corp, and is available with ALEKS 360.